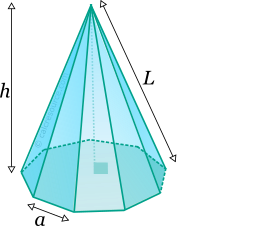 This tool calculates the basic geometric properties of a right pyramid, with a regular polygonal base. Enter the number of base edges 'n' and the shape dimensions 'a' and 'h' below. The calculated results will have the same units as your input. Please use consistent units for any input. where n the number of edges/vertices of the base. where \(a\) the length of an edge of the regular base polygon.